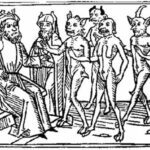 Belial, from the Hebrew meaning worthless, was a major player in the cosmic struggle between the Sons of Light and Sons of Darkness in the Dead Sea Scrolls. Championing the Sons of Darkness, Belial led an army of spirits of destruction against God. Sometimes he is depicted as God’s direct adversary. Other times, he is a rebellious angel along with Mastema. A few sources mention he taught the Egyptians magic so they could oppose Moses and Aaron. Read articles about Belial below.